Torah, all reality around them - turns black, too. I had dinner with such creatures Friday night. 5 young Yeshiva guys from Neve Yaakov's prime (I'm sure) Yeshiva. What does their Rabbi tell them? "Just introduce her as your sister." I can elaborate on my impressions of a Rabbi who would suggest such a thing, but I think anyone reading this is just as nauseous. uncomfortable - let alone lying? ridiculous that you can't even try to deal with them in a real way. into trying to be good, that evil and exploitation are oh so close. been the one causal with modestly, careless with sin. side with my seat that I was now standing behind. hats, inside their flushed out brains. A total violation of all that is sacred. Right there across the table from me. the end eventually had to come to my side. But the war wasn't over. comedy in the whole thing that held back my tears. further away, he took his seat. blocked them from the very reasons they proceed like they do. drown in pride from your performance, I must say. Hear you me. Trust me. I believe in the sensitivities that should exist between male and female. I believe in the strength of certain realities, and the awareness they require. I believe in borders, and healthy barriers, and the beauty they promote. I also believe in living the message. I believe in peoples' feelings. I believe in being inward, and maintaining subtlety there as well. You believe in the external. You believe in rules, in a game. You believe in the power of sin. You believe in violent refusal to sit aside a girl at a Shabbos table. had nothing to do with Friday night's events. sexuality all over the Shabbos table. You can go back to your Gemara now. Right now, I'm chocking on my experiences of the past three days, trying hard to digest all the subtle chaos and total insanity that has taken place. Sometimes I want to snap my fingers and be some close-minded Jew who doesn't give a darn about the world, and all I'd have to do is take care of myself...it would be so simple. It would also have been nice to continue growing up as Mimi from a Chabad family who went to NYHS and to Israel for the year, and...ladidada. But, no. I had to discover this life-energy that flows through everything, and I just had to gain a conscious that led to a passion that screams clarity and truth and realness. And now, there's no turning back. I've been swallowed, and the truth really does hurt sometimes. I'm trying to stop all the images in my mind of rushing black hats and cold stares that painted my weekend in Jerusalem. I will feel forever guilty for having such a numb response to our holy city. But alas, it's holiness that goes wrong the most, that turns the most astray. And the turth is, I'm not numb - I'm actually burning inside...trying to figure out what to do with all this. I have images of my brother Saadya embracing these black hat yeshiva boys, finding that point of similarity between his seemingly different fellow Jews, constantly flooding Israel's streets with light. Apparently, I'm just not there yet. In many ways, I tried. But, in the end, I was completely phased, totally tired, and craving my return to Tzfas. I love Israel. I love my people. However, walking around Jerusalem, it felt more like an ideal than a internal and active reality. Jerusalem left me feeling a little down about the state of my people. Although I feel powerless at the moment, I'm going to do something about it. Jerusalem made me feel lucky, proud, and tremendously thankful.It also left me feeling alone, skeptical, and aware of the many things I have to work on. This is an intro to some experiences from the weekend that I will be writing about. This is me waking up the the fact that Tzfas is really an awesome bubble. I'm going to try soaking it up as much as I can. This is me recomitting myself to becoming a lamplighter. Clearly, I have much work to do. No one looks you in the eye here. Trampling over each other to get to heaven. Jerusalem has lost its sparkle. City of fire - rising to nowhere, dropping ashes, sizzling. This place is holy. This place is holy. This place is being abused. Uptight warriors. Depressed mothers. Cold stares. No subtlety. A young boy with a black hat and payos winked at me. I can feel his unconscious pain. The light is burried beneath every one's hurried shuffles. I feel lonely in our holy city...and a little confused - but a lot guilty. I selfishly await my return to Tzfas. Meanwhile, I'll try to snap myself out of this bewilderment, try to find thr light and spread what I can. Today is the Rebbetzin's Yartzeit. I couldn't help but feel lost and frustrated at the farbrengen last night. A teacher is leading the farbrengen, but she doesn't know any more about the Rebbetzin than we do. She can only talk about what we don't know, and when we do have a small insight, we explode it. We want so badly to have something to hold onto, something to take and channel into our daily lives. So we all sit and ponder and imagine and grapple with the lack of information. Much emphasis is put on the fact that the Rebbetzin led a very private life, and here we sit dissecting her life and searching for clues into her essence. I know much about what the Rebbetzin gave the world, but little about her life. But, alas, that is the message. What is a holy person? Holiness is subtle, sensitive - yet it's power is unfathomable. It's strength is overpowering and succinct, but it draws nothing to itself. In general, the Rebbetzin's image floats in and out of my mind. But when I approach lght and dark, when I have to grapple with holiness, her message is clear. I don't need to know about the Rebbetzin's essence, the details of her life. When everything is quiet, the Rebbetzin's energy hits like a brick. Strength is where strength seems to not exist. True existence is that which makes us look upwards. We can't fit the truth of realities into our palms. I feel weak and teary-eyed trying to really capture the Rebbetzin's message and extend it into my life. I miss the Bais Chana days. I'm tired, and I feel like my feet have been hovering two feet above the ground for the past couple of days. Things can get pretty intense over here, and the focus can get somewhat lost. Today, I just went through all the motions. I had to rest. It's fun being so idealistic, but..I dunno. I miss Seattle a little, or at least all the mundane normalcy I left behind. I was thinking today about vintage shopping, Starbucks, and even the squirrels. I feel like dropping this whole blog thing. Stop screaming from the hilltop. I don't want to get ahead of myself. I want to absorb more than I'm shouting. Let things sit, y'know? Writing and sharing has become an inescapable part of the living me, but I just want to be a little trivial for a bit. I'm allowed, right? I want to get in touch with the Mimi that paints, gets into music, and stares at the wall. I think there is much revelation there as well. I'll be back. Sarah, Sheina Ettel, and Miri. Within the first 5 minutes of meeting Sarah, we were out eating falafel, snapping pictures, and talking about journeys. I was still trying to get Sheina Ettel's name straight while she was in my room listening to a Manis Freidman tape while cutting my hair. I knew all about Miri's ex-boyfriends and her thoughts on G-d - dare I first know where she's from. I guess certain things just don't matter when all you want is closeness, connection, harmony. I can't say enough about the beautiful speed in which connections are built with your fellow Jew here in Tzfas, at Machon Alte - in the air of Chassidus. There's so much to learn, so much beauty to reveal in people. You gotta run to the center with a smile. Its never happened to me like this. I've never experienced such avoidance of barriers, such running to the core of another person - knocking down every thing else "in the way." Just one more thing to "blame Chassidus" for...or at least that's how I see it. Myth #3: "Chabad has this shtick with Moshiach"
shtick also schtick or shtik n. Slang 1. An entertainment routine or gimmick. Sometimes, the small passing moments or comments in class reveal the most. It happened in Rabbi Pasternak's sicha class. In one of the Rebbe's sichos on Yud Shvat, he discusses the spreading of Chassidus and how each of our Rebbes had a particular way of giving over Chassidus to the masses. In one line, the Rebbe talks about how the Baal Shem Tov gave the light of Chassidus to "non-Chassidim." This spurred a whole conversation in class about misnagdim. Rabbi Pasternak was saying that, today, there is no such thing. There may be "non-chassidim", but no one can really be considered a misnaged anymore. In typical Machon Alte style, one of the students rose to debate: "What do you mean? There are so many people who are anti-Chabad today!" And I love what Rabbi Pasternak said. "No, these people aren't opposers to Chassidus. They just have their Moshiach shtick." The non-Chabad world has "moshiach shtick?" Is this guy joking? Come on, Rabbi. Every one knows who has the shtick - let's be real here. We can admit that we got the shtick going on. Let's not turn the tables. But Rabbi Pasternak wasn't doing any table-turning. In passing, he shed light on a seemingly controversial topic and went straight to the almost comedic core of the "issue." The people today who seem to be "anti-Chabad" or "misnagdim" usually have this whole issue with Lubavitchers believing the Rebbe to be Moshiach. And, you see, this is where the shtick comes in. They talk about it. They laugh about it. They reduce Chabad to this one belief. They can't get into one discussion with a bearded guy without asking him, "so, do YOU believe the Rebbe's Moshiach?" They won't go to the Rebbe's burial place - the resting place of a Tzaddik - because of it. With their ever so valuable free time, they create disgustingly mocking and pathetic websites about it. When they hear that you're close with Lubavitch, they freak out and elect themselves to inform you of the "dangers of the Chabad derech." When they hear that you're totally going to be changing your life by going to a Chabad school, the only thing they find in their brain to ask is, "well, what's their take on the Moshiach thing?" Yea, it reveals much weakness and insecurity. But really, it's all just a routine, it's all just a gimmik. Really, it all comes down to shtick. These people get worked up. They invest energy and frustration. How could you possibly believe the Rebbe's Moshiach?! They get innovative with their arguments, and discuss it with their Rabbis. It's like an excercise. They actually sweat. And their performance gives them pride. The (meshichist) Chabadnik, on the other hand, is grounded, strong, and real with his own beliefs. He waves his own flag proudly, and any of his efforts outward are always focused yet quiet and humble. He won't pull any shtick about YOUR beleifs, you can rest assured. Because the Chabadnik finds no impulse to have any shtick about the beliefs of others. The Chabadnik will be glad to discuss the "Moshiach issue" with you. But come on, just drop the show. Drop the entertainment. Just turn off all the Moshiach shtick. The other day, R' Stroch caught himself saying "whatever" and quickly corrected himself in his normal mode of self-deprecating humor by saying, "Wow, that is the most un-Chassidish thing to say - a Chassid never says 'whatever'". I was thinking about it, and...I think he said something so huge, so true. I think right there, in a crowded and crumbling room at Machon Alte, he defined the antithesis of Chassidus, and a "Chassidishe lifestyle". The more and more I'm learning Chassidus, the less "whatever" I'm becoming. I've become so clear and direct with my opinions, so unwilling to sacrifice truth for a second, so in tune with a MISSION, so craving more...unable to rest. I will admit, though, that last night, I had one of my first "whatever" nights in a while. I found myself feeling a little bored, a little detached from the fire, a little removed from all the excitement and drive. Not depressed, not bothered..just stagnant, just "blah". And it actually hurt. Because once you gain the flash of knowledge, the insight, and you trust the depths - you can't rest with anything less. Sitting in my room, not knowing what to do with myself...I actually felt my soul rejecting my "whatever" moment. And it was painful. Sometimes I want to wage war against all the Chassidus I'm learning. I just want to see a tree as a tree. I want to read a Pasuk and not know that there are layers and layers to uncover. I want to lie on my bed and stare at the wall in superficial thought. The other day, while saying Shema, I almost started to cry. And not because I was touched by the words, or moved to any sort of level of understanding - it was just the opposite. They say that a whole Torah can be written on the six words of Shema, and I've learned only a fraction of a fraction of what there is to know. And why do I have to say Shema everyday knowing that I'm not even coming close to saying it with all the proper intentions and mindsets, that I don't even understand the top layer of it's beauty and power? Why can't I access the layers? Be in touch with the snap of a finger? It's all just too demanding of me. I'm way too little. When you learn Chassidus - REALLY learn Chassidus - you just can't run from the action, can't escape the world, the realness of life, the truths of this world. There's a focus, a directed energy of reality and clarity and power and insight. I just can't seem to chill out. And I have Chassidus to blame. I usually plan to come to the computer totally inspired and uplifted from classes, with the intention of sharing and illuminating and inspiring. But it just can't happen tonight. Tonight, I feel dead inside. I feel suffocated, and dazed, and angry. I am usually graceful in the face of darkness. I feel like I can uplift it. I feel like I have the power to pierce through it, to reveal and create a pathway of clarity and goodness and purpose. For the first time ever, I feel like I can grasp what the Rebbe said about the times before our ultimate redemption - that there will be "darkness of darkness", a confusion so thick and blinding that you can't even attempt to make sense of it or release yourself from it's entrapment. I want to pretend. I want to hear the Rebbe's words in my ears and know exactly the right way to react and feel. I want to say Perek Lamed-Beis and Mem-Aleph of Tanya and feel better. But I can't...and I will not lie. Right now, over two hundred of my brothers and sisters are lying on hospital beds, beaten and bruised. The front page of the newspaper today sent me straight into emotions that I've never had to grapple with before. Jews beating Jews with rods?! All of my being struggled to make sense of it, but when I tried - my soul felt like it was going to explode. There are certain insanities that a soul just can't bear, can't tolerate. It felt like the world just ended - right there on the front page. Tonight, I have some questions for you, G-d. When will you reveal your master plan? Why are you dragging things out? Why are you empowering my enemies? Why are you sitting back while blood pours from your children? Why did you dare call this place my homeland? I hate your facade. I hate your concealment. I hate how much I need you, and I hate how you seem to be running away. And tonight, I want to hate your country. Tonight, I want to hate your people. Your world just got flipped upside down, and I can't sit straight. Answer my questions. I need answers. I have some live Matisyahu playing in my ears right now, and he's telling the crowd that no matter how blinding the dark, "a person has the ability to dig deep and see through the world, see the G-dliness." And I'm studying the newspaper right now, trying to see the picture through my blurring eyes. 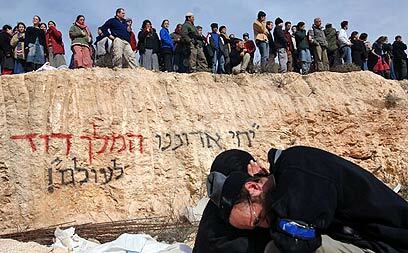 A crowd of young Jews trying to protect their home, while Jews on horses lift clubs to their faces. Behind the pained and struggling faces, behind all the chaos...is a banner. It reads, "Hashem Hu HaMelech - G-d is the King". The contrast almost breaks my heart. Jews beating Jews. G-d is King. Jews beating Jews. G-d is King. But for me, right now - struggling for comfort - the message seems clear. G-d still reigns. He has a plan. He is ruling. He has not fled the scene. He's not just sitting back watching the smoke rise. G-d, a King to a mighty nation, is crying right here alongside his people. His tears are shaking the earth beneath my feet. So for now, I am still in the dark. I will cry. But I don't feel so alone - "Hashem Hu HaMelech". My King is unleashing his wildest tears right by my side. May all our tears soon evaporate from the light and warmth of Moshiach. For Moshiach is the only answer. [Here in Israel, everyone is in total shock, a sort of daze. The holocaust-like images and stories of policemen ripping off the shirt of a Jewish mother, knocking a toddler to the ground...no one can even talk about it. The "State of Israel" has finally gone completely mad.